Falls Avenue Resort’s Niagara Culinary Experiences Series is back for another season, offering six exclusive dinner events throughout 2017 and 2018 at the Rainbow Room by Massimo Capra and Windows by Jamie Kennedy Fresh Grill & Wine Bar. Each of the dinner events will feature delicious and innovative dishes prepared by Niagara’s top chefs and award-winning wines from all over Niagara and the world. The first dinner in the series is A Culinary Tour of Piedmont with Chef Massimo Capra on October 27th, which will showcase the best food, ingredients, and wines to emerge from this charming Italian region. Following this dinner is A Farmhouse Christmas Dinner with Jamie Kennedy on December 1st where a traditional turn of the century Christmas feast will be served using local Niagara ingredients and paired with wines from Bachelder winery. The third culinary event in the series is An Icewine Dinner at Windows by Jamie Kennedy Fresh Grill & Wine Bar on January 19th, hosted in celebration of Niagara’s unique Icewine harvest and the delicious food that the season brings. 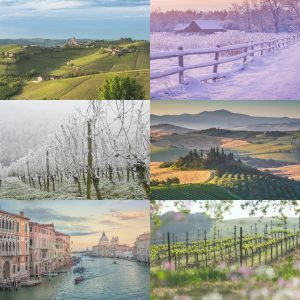 This dinner is followed by A Culinary Tour of Tuscany on March 23rd at the Rainbow Room, A Spring Fling in Niagara at Windows on April 20th, and A Culinary Tour of Veneto at the Rainbow Room on May 11th. Dinner-only and Dinner & Hotel Room packages can be purchased at fallsavenueresort.com/culinary, so make sure to book your tickets today to experience the incredible combination of food, wine, and breathtaking views of Niagara Falls.